The jaw thrust is a method of opening the airway of a patient. The airway is very important in first aid! It consists of the structures in the back of the throat and upper neck. 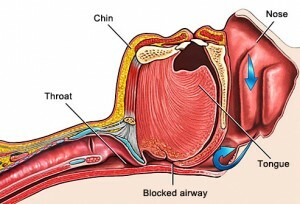 A patient who is unconscious is not able to maintain their own airway as it can become blocked by the tongue (see picture). Normally, first aid courses teach the head tilt – chin lift technique to open an airway. However, this airway manoeuvre involves significant movement of the patient’s neck. Therefore if there is any suspicion of a spinal (neck) injury it may cause further damage. When a neck/spinal injury is suspected, the jaw thrust technique can be used instead. The main aim of the jaw thrust is to bring the chin forwards without moving the neck. This lifts the tongue from the back of the airway and relieves obstruction. It is worth noting that there are a variety of different jaw thrust techniques used across the world. They all however have the same aim, to move the lower jaw forwards with minimal movement of the neck. What does ACLS stand for in healthcare?